Poseidon was one of the twelve Olympians of ancient Greek mythology. 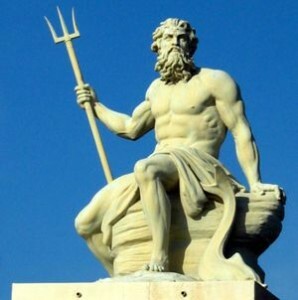 He was also the Greek god of the sea who was given the island of Atlantis as his realm. The Romans later knew Poseidon as Neptune. Herodotus (II.50.2) claimed that the Greek gods were imported from Egypt with a few exceptions including Poseidon. Some have suggested that the ancient Egyptian god Sobek was the equivalent of Poseidon, but the connection seems rather tenuous. Some writers have suggested that Noah was to be equated with Poseidon. His symbol was a trident. *Poseidon is also credited with having been the first to tame horses. * Others, such as Nienhuis, have equated Poseidon with Sidon referred to in Genesis 10:15. The Phoenician sea god Melqart is frequently seen as the son of Poseidon whereas others, such as Jonas Bergman, consider them to be identical. The Nordic sea god Aegir is also seen as a mirror of Poseidon. In Portugal, Saint Bartholomew is considered a Christianised Poseidon, where statues of him are similar to those of Poseidon including a trident. The Celtic god of the sea was known as Manannán Mac Lir who is frequently associated with the Isle of Man in the Irish Sea. *When the Greek gods divided the world among themselves, Poseidon received Atlantis as his share. He fell in love with a mortal, Clieto, who bore him five sets of twin boys, of whom Atlas was the first born and primus inter pares. Atlantis was then shared between them. In December 2017, Anton Mifsud, Malta’s leading Atlantologist, published an intriguing suggestion(a) , when he pointed out that on the ceiling of the Sistine Chapel, painted by Neo-Platonist Michelangelo, something odd can be perceived in the central panel, known as The Creation of Adam. There, we find ‘god’ surrounded by five pairs of flightless ‘cherubs’. This is reminiscent of Poseidon’s five pairs of twin sons. Atlantis. However, Christian iconography invariably shows cherubs with wings, so it begs the question; why this departure from the norm? Mifsud contends that together with other aspects of the fresco, this depiction is closer to Plato’s ‘god’, Poseidon, than that of the Mosaic creator in Genesis!